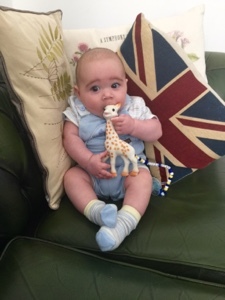 This week my baby nephew Riley turns 6 months old, and boy, what a journey it's been! Over the months I've witnessed my sister buying various toys, milk formula's, sleeping bags and clothes. 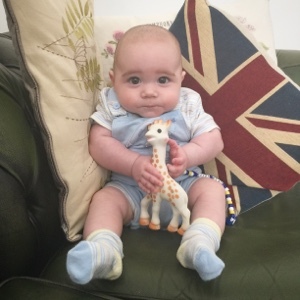 When Riley was born, he wasn't very well - having had a bumpy start to his life, my sister now spends hours researching each purchase to ensure she's made the best selection out of the hundreds of options to help with his development and co-ordination. 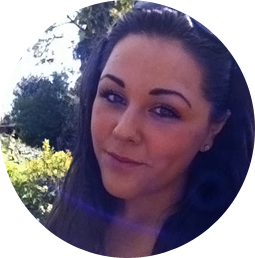 My sister has worked in a school for years and is a trained nursery nurse - having an understanding of child development she tries to choose items that will stimulate and engage Riley. Wanting to share these pearls of wisdom with you, I've decided to start 'Auntie Blogging'. 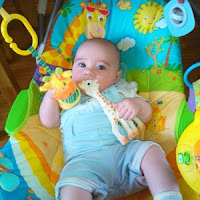 Our first review is of the beloved Sophie La Girafe. Having seen a lot of buzz around the teething toy online and rave reviews on John Lewis, we decided to buy one to test it out. We noticed it was more expensive than other teethers on the market, and have to admit we were sceptical if it was worth the extra money. The fact that it is made from natural rubber derived from the sap of the Hevea tree, meaning it is phthalate-free, swayed our decision. Another main selling point was that the toy is painted with non-toxic food-grade paints and contains no vinyl or PVC - perfect for soothing tiny gums without any nasties. 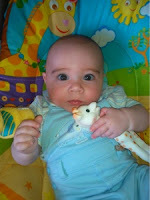 We've found the toy was very easy for Riley to hold due to it's long neck and limbs. As you can see from the pictures above, his favourite area to chew is its head (probably due to the bumps representing the giraffe's horns). Before we bought the toy we had read that sterilising can destroy the squeaker, so my sister uses cold water and sterilising tablets which seems to have kept it in tact. Riley doesn't seem too fussed about the squeaker however, but that may change as he gets older and has the strength to squeeze the toy himself. 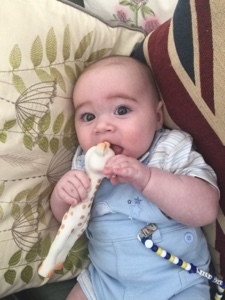 If you're looking for a teether we'd highly recommend Sophie, it's a tad on the expensive side but seems extremely durable, meaning Riley should enjoy chewing it for months to come. It also comes packaged in a beautiful gift box, making it an ideal gift for a new birth or Christening.